Craigslist worked for me 3 different times! But I also had traction with Linked In. 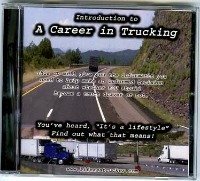 If you are a trucker with trucking experience that is not recent you will probably need to take a refresher course for most companies to seriously consider you for a trucking job if it's been more than 5 years. However, timing is everything. If a company is hurting for drivers and you walk in or call at the right time, it could be your lucky day with as little as a driving test. 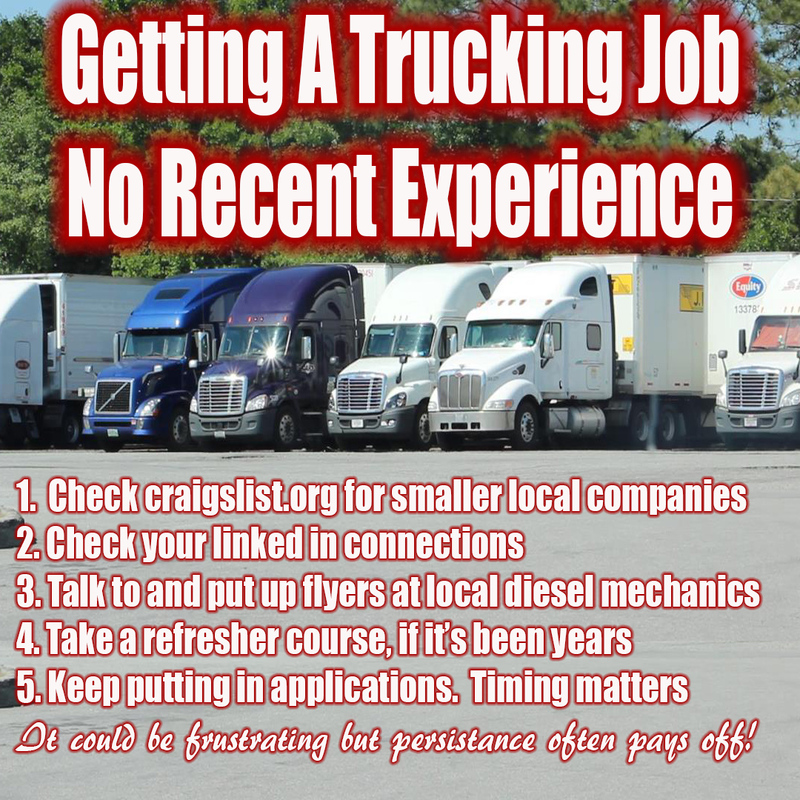 Another problem you will face of course, is that most companies are not going to volunteer or agree upon starting your pay as an experienced driver because your past experience that is not recent. With this page we hope to try and help with that scenario by letting owner operators who will give an ex driver with no recent experience a chance at the big road again. You guys know as well as I do that a driver who has driven for years doesn't easily forget what is required of him/her as a trucker as far as driving the truck goes. However, don't forget to go over the change in rules and do some training on the ELDs if the driver hadn't driven since they've been required. Let this page be a benefit you and the ex drivers. Don't abuse it, use it as a tool. If you are a driver list yourself below, if you are an owner operator find a trucker that is compatible for what you have to offer. 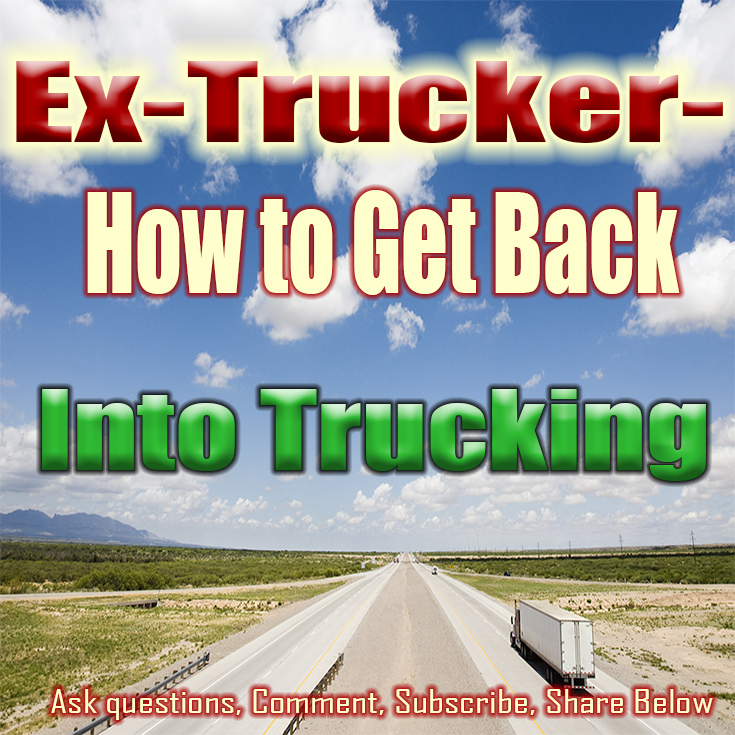 Ex-Truckers With No Recent Experience Sign up below. For drivers with old experience driving and looking for a trucking job sign up below and then share the page using the pictures at the top of the page. It links back here. For owner operators looking to hire drivers and help them get current experience feel free to post it along with the requirements. Be sure to list your background and why you should be hired. It would help to show you have a great attitude and work ethic. See How Other Drivers Have Listed Themselves. like to find local if possible. Home a few days or atleast weekends. Van. In Florida looking to start driving again with no recent experience. Haven't driven in 9 years.I have a valid cdl with triples doubles and tanker. I havent driven in 8yrs.I am looking to drive locally in the city of Jacksonville. Michigan Driver seeking a trucking job! Tn driver seeking a job. Something based close to the Wichita or Hutchinson Ks area. Prefer home weekly if possible. Something within 50 miles or so in the Little Rock area. It has to be local or close by regional. I cannot do OTR. Driver in Monroe, Michigan seeking a job. Clean driving record and background. 40 year old Jackson TN woman seeking an otr driving job!! 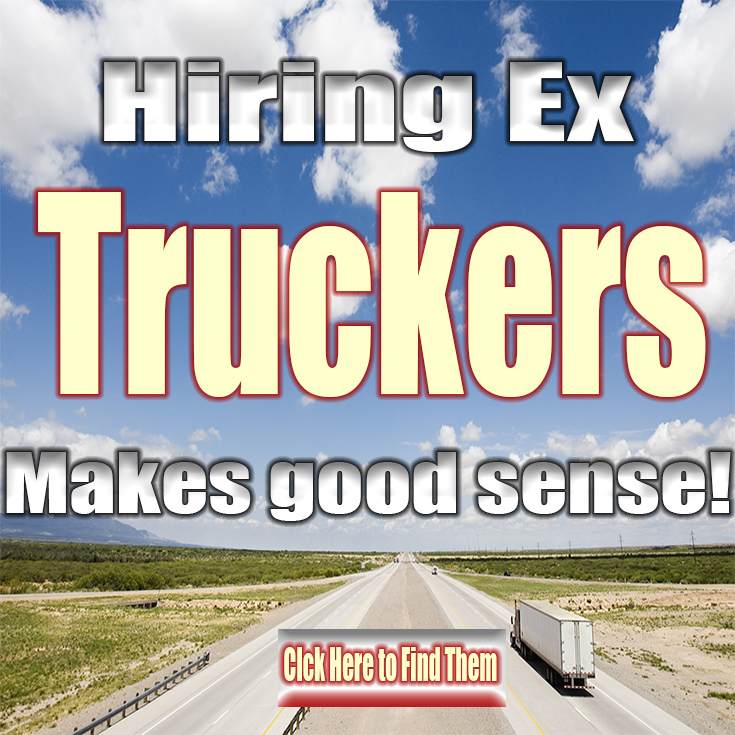 OTR driver with over 10 years exp but no recent. Local, OTR, 48 states.CDL A Qualified driver,but no recent OTR time. South East Michigan or Florida Driver seeking a Job! SWIFT Fires you for running over a bee! If I can get my blood pressure right I have been dispatching for 7 years to help out but I miss the driving and the money. Driver with about a year experience seeking a job. Florida driver seeking a job. Drivers who are looking for a GREAT Company to work for! Ex car hauler looking to get back on the iron horse. Car hauler or flat bed preferred. Greenville, SC. Professional driver with no recent experience seeking employment. I'm a o/o with past experience looking for a job. Ex trucker started driving in 2001. Went away for awhile now I'm looking to lease my truck . I've been driving again now for 6 months. NC Driver with little recent experience. A Professional Driver licensed in 1997, no recent experience. Tx driver looking for opportunity to drive long haul. 47 year old driver looking to drive again. 38 Year Old Male who has been out for a while and now wants back in!! I have 10+ Years of Class A Experience, but not Recent. I have been out of trucking for about four years and now I want to get back to driving. Looking to go otr for someone that is in need of a driver. I'm hard working and have had my CDL a since 2001. I'm looking to get back into trucking. I need refreshing and to get my DOT card. I haven't been in a truck for 5 years looking for some company to getting me some training with out me have to go to some refresher course. Need Help Finding a Job! i am a single driver. willing to team if it means me getting the experience. local or otr. I am not a owner operater but I would like to lease purchase! A refresher course. A company that has a refresher course hiring out of Florida. Trying to get back on the road. Driver seeking a Class B Truck with Air brakes to use for walk around and driving test. want to get back in trucking but need a refresher course. I am not a owner operator . I have been out of trucking for a while and I need a company that can help me to get back into trucking. dependable truck, steady loads, home once a month. Clean MVR and safe driver. i am a NY truck driver with 10yrs experience seeking a job!! Ohio driver need a trucking job, can I get one with an accident on my record? Looking to get back into a truck in GA.
Haven't driven otr for seven years and looking to start up again. Have had my cdl since 1989. Previously drove for Swift. Detroit driver seeking a local trucking driving job. Washington Driver with 2.5 years experience wants to get back OTR. I have nearly 19 years experience, most OTR. No accidents, tickets, felonies or failed drug tests. OTR Driver looking for a new lease on life. florida Driver looking to get back on the road. need to get back on road 7 yrs.exp. hoping for southeast runs.2 yr. gap ready to roll. 10 yrs experience driving and 5 as teacher. Two year break, ready for the road again. Driver seeking a truck driving job. I have 1 year experience. Quit driving in 2008 to attend school but job market is tough and need to get back on the road as soon as possible. 1 year otr experience. I am driver seeking a job. Driver seeking a job. 1yr exp with 3yrs off. 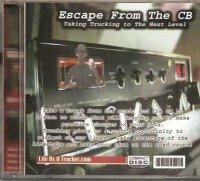 Looking to get back into trucking. CDL Class A driver looking to run hard and safe. anything right now over the road,regional,local i can pretty much handle anything right now. I am a good and responsible driver. Ohio Driver looking for dedicated coast to coast reefer work. I've been driving for 16 years and I'm burning out on it. I'm interested in the safety direction in the transportation industry any info could help. Training to be team driver. I'm looking for a dedicated run in the Los Angeles area. Used to drive for CR England & JB Hunt.need to take all tests again. get my cdl. did not carry it over when renewed my licence.thought i was done. miss it. Looking to start driving again. Still have my cdl, and medical card. I would like to run the midwest or the southeast. I retired 5 and a half years ago and gave up my CDL. Now! I would like to get back to driving again. a job that only needs 6 months of experience. I would like an 8 speed or automatic. Looking for a trucking job.please give me a call if anyone have any opening.423-320-2155 live in the chattanooga,tn area.do not want new york city. My name is Denisha Stokes. Need to start driving again. I drove cross country for three years and trying to find a local driving job. Looking for Local Part-Time Driving-Towanda,Pa area,Pulled last load Jan 2011. Retired from Schneider National 22 Years. Looking to work ASAP with out all the BS i need a chance, new to this State & need a brake in to work force Now, I have a family. i have being off the road around 37 months ago.i have a clean driving record.a day or two insude a cab and i am good to go. We are a small company in San Antonio EX. Looking to hire drivers to haul cement, flyash. This would be local runs. Have not driven since 1992. I have a CDL A. I want to get back into trucking. looking to get back out there and work hard, and get my skill back up. Got my class A, need refresher course and job. I'm just looking for some one to give me a chance to prove myself and to get my self back in the driver seat. I have a current Class A CDL but I need recent experience. Im looking for an owner operator that can help me get back on the road. Looking for second chance truck driving job. drove 5 months for ptl and werner in 2006. Looking to get back in the industry. i have 8 months exp,stoped for a little bit,need to get medical exam up to date then cdl would be good doesnt totally expire until april 2013.
i drove over the road and some local dump trucks for 15 yrs now im a small engine mech at sears for 11 yrs id like to drive a dump truck or otr. I'm still in trucking at the local level for the last 5 years, I would like to be an or driver again. Over the Road, Southeast Regional Driving Position. former owner operator with substantial experience looking for driving opportunity. Ohio I-75, I-70 haven't driven in some time ! looking in getting started back trucking over the road driving again. Let's go O/O everybody wins. Happy Ex trucker back on the road getting a fair (or more fair than he would have otherwise gotten) wage and the owner operator or company has a good seasoned driver who is loyal and content (that is if you treat him right). List your information above so that you can connect with each other. We will not be held responsible if you mistreat each other and we will not be held responsible for negative comments that come back to this page if you mistreat each other. That's on you. We are trying to help you so don't list yourselves with ill intentions and treat each other right.